Please be gentle when you press the glass to extrude bubbles. • There bubbles can't be removed during the installation. • The warranty continues from the date of your original purchase date. It won't be renewed after a replacement has been provided. Notice: Please watch our INSTALLATION VIDEO carefully before installing the screen protector. The video will guide you installing the screen protector to your device successfully. Carbon Fiber Frame Edge- 3D Carbon Fiber Curved Edges can protect your Watch screen from scratches all around. Top Grade Protection- 9H high quality tempered glass will protect your screen from daily scrapes and abrasions. High definition and touch sensitive film, smooth touch and zero delay operation. Attach and Exhaust automatically.Compatible with Apple Watch series 1, series 2 and series 3. 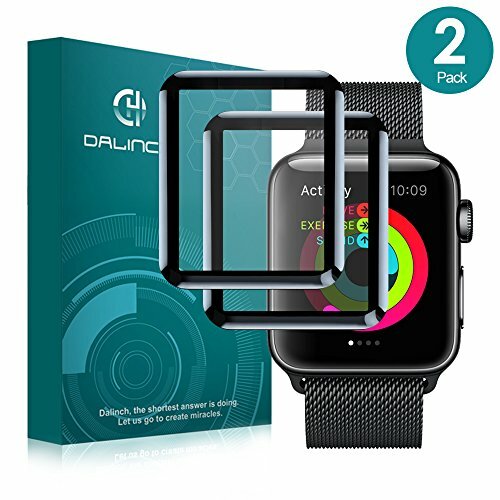 If you have any questions about this product by Dalinch, contact us by completing and submitting the form below. If you are looking for a specif part number, please include it with your message.